Pogo has made one Pogo Daily Sudoku Mix-n-Match badge available in Badge Central for 16 Gems. This badge will be available until March 20, 2020. 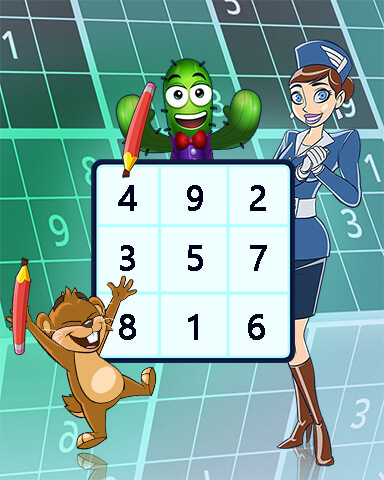 Win 10 puzzles on easy diffculty level in 2 weeks! What do you think of this Pogo Daily Sudoku badge? Do you have any tips you’d like to share for completing it? Share your thoughts in a comment below. Lura, do you know why the other 3 badges for Pogo Daily Sudoku were taken off the badge list. On the 13th of March I bought 3 badges for Pogo Daily Sudoku, Spiking The Numbers-get 40,000 scores in 2 weeks, Gophering It Out-spend 5000 seconds to complete the puzzle in 2 weeks and Puzzling With Pam-win 8 puzzles in 2 weeks. While the wording was quite puzzling i figured them out, Spiking the Numbers is get 40,000 cumulative points in scores, Gophering It Out is use 5000 cumulative seconds in completing puzzles. However they are not on the list anymore for my friends to buy. The other 3 are still there. So sorry to bother you, when I read your reply, I remembered I didn’t click the box for show badges I’ve earned. P.S. this new badge will be a breeze. Did they forget that they released 3 of these already? I think this badge should have been the free one pogo usually gives us to celebrate new released games. They already had the usual 3 badges for sale last week for this game. Someone possibly dropped the ball. Think I may wait till next week as next weeks weekly challenge is win 10 puzzles. So will be same as winning 10 on easy. 🙂 Just a suggestion. While waiting for Wednesday, you may want to go in and open the current day to unlock it unless you plan on do one single puzzle 10 times. Just opening the day keeps it unlocked even if you do not work one of the puzzles. If working an a challenge to get a certain number or puzzles solved, like a badge at 25 easy or 50 hard, etc. Is there anyway to see what you progress is for that easy, medum, or hard? Thank You. Its no in statictics? Not a weekly challenge but a game badge ? I check stats to note how close I am to completing a challenge but that’s pretty much it except for Sundays’ Trivia Pursuit which delights me when I see its’ conclusion and the token amount. Am now seeing robins in WI. Yay!